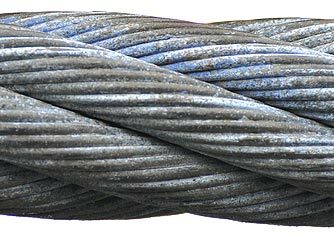 Wire rope consists of several strands of metal wire twisted helically about a central axis known as the core. Each individual cyllindrical steel rod or thread is known as a wire. Each group of wires twisted together forms a strand. A group of strands twisted around a central core known as a wire rope or cable. Sometimes a filler wire is used to fill voids between wires in a strand to provide stability to the shape of the cable. Wire rope was originally created to replace steel chains which had a history of mechanical failure. Where one flaw or weak link in a chain could lead to catastrophic failure, flaws in steel cable are less critical as the remaining strands take up the load. Furthermore the twist of the fibers produces friction between the individual strands maintaining the strength of the cable even when there is some damage. Historically wire rope was created using wrought iron however today wire ropes are typically made of stainless steel wire which is extremely resistant to corrosion and can withstand temperatures up to 1050°C. Wire rope construction is designated by two numbers, the first is the number strands in the cable and the second refers the number of wires in each strand. The correct method of determining the wire rope diameter is to measure from the top of one strand to the top of the directly opposite strand. The incorrect way is to measure across two strands side by side. To ensure an accurate measurement of the diameter of a wire rope, always measure the rope at three places, at least 5 feet apart. Use the average of the three measurements as the diameter of the rope. 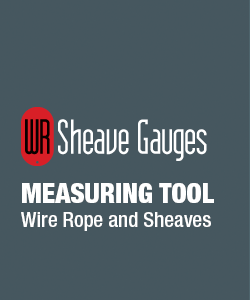 WR Sheave gauges manufactures two types of Wire Rope Gauges as a companion to our Stainless Steel Sheave Gauges -- A fitting Gauge and a Go/NoGo gauge. The +5% sheave gauges come with a Nominal (Actual Size) Wire Rope Gauge. To get an accurate measurement the Wire Rope should be measured from an outside edge to the outside edge of the opposite stand. If when measured the widest part of the wire rope can be inserted beyond the edge of the gauge measure again using the next smallest gauge. If the wire rope doesn't fit at least half way into the gauge measure again using the next larger gauge. Our +2.5% Stainless Steel Gauges come with a Go/NoGo Wire Gauge. 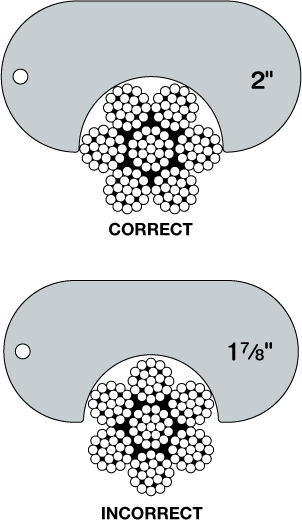 The measurements are based on the American Society of Mechanical Engineers (ASME) Standards for Elevator Cable Wear (ASME A17.6-2010, Section 1.10). The gauges have a double notch showing where Unfavorable Wear Conditions occur for Wire Rope with and without evidence of Rouge (Rust). Wire Rope showing Rouge (Rust) should be replaced when the diameter has been reduced below 3.125% of the nominal size. Wire Rope without evidence of Rouge should be replaced when the diameter has been reduced below 6.25% of the nominal size. Note: For wire rope diameters below 3/8" or 8mm, the maximum allowable reduction is 3.125% and the wire rope should be replaced if there is any evidence of rouge. Try to insert the wire rope into the gauge. If the wire rope does not fit in the gauge the diameter meets or exceed the necessary size for the application. If the wire rope fits into the gauge up to but not exceeding the R/N line it should be replaced it there is any evidence of rouge (rust). If there is no evidence of rouge the wire rope is still within the acceptable paramters. If the wire rope fits all the way to the bottom of the Gauge it has exceeded the maximum allowable reduction in diameter and should be replaced.